The RT Burn-off Ovens by Armature Coil Equipment (ACE) are your ultimate solutions in heat cleaning and energy savings. The oven is primarily designed to remove coatings such as oil, epoxy, grease, paint, varnish, rubber, and combustible materials. Virtually any metal part ranging from paint hooks, motor stators, engine components, and bonded rubber-metal parts can be cleaned with this product. The design of the oven is unique; it utilizes a combination of radiant and convection heating. The use of these two heating technologies results in high heat extraction efficiency up to 93%. Furthermore, the RT Series oven provides 20% higher energy savings than general convection burn-off ovens. The convection plus radiant energy design allows for maximum heat transfer preventing any cold or hot spots. Rapid heat-up and cool-down processes result in shorter cycle time. Short cycle time result in 20% fuel savings. Heat uniformity is maintained at +/- 10°F. The oven eliminates the primary burner box that is used in other ovens. Due to its low intensity heating process, the proximity between the oven and the load can be reduced without any fear of concentrated heating. The radiant tube heating system used for the primary chamber is simple to install, and easy to maintain. Ceramic blanket wall surfaces of the oven allow it to indirectly reflect and emit radiation at the same rate. Multiple holes on the sides of the radiant tube maintain a steady stream of convection heat. The heater tube comprises a heavy gauge stainless steel enclosure, which provides long-term reliability, and is easy to maintain. It provides efficiency in terms of combustion at 93%. The convection heating system allows for the wall surfaces to remain cool as a low amount of heat is used. A primary and back-up secondary water suppression system is also supplied to prevent run-away fires. The oven also features an optional One Touch Control (OTC) automatic self-adjusting system. This allows it to automatically control the interior combustible vapor during an operation. Automatic programmed timing sequences allow the oven’s heat cycle to run as long as required to clean a part. The oven is designed to conform to EPA air emission standards. All discharges to the atmosphere are harmless by-products of combustion. 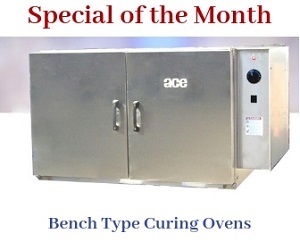 ACE provides a range of 30 burn-off oven models, and over 50 accessory items at reasonable prices.